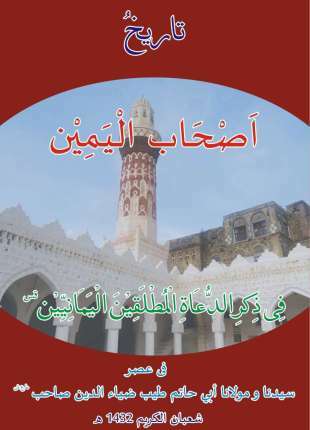 It was a wish of Saiyedna Abu Haatim Taiyeb Ziyauddin Saaheb (tus) to publish a book containing the history of Du’aat ul-Akrameen (aq) of Yaman and India – from 532 AH. It was difficult to get a complete account of history in one book. But the wish of Saiyedna Saaheb (tus) gave an impetus to this mammoth project. Saiyedi Mazoon Haatim Zakiyuddin Saaheb (dm) and Saiyedi Mukaasir Mohammad Nooruddin Saaheb (dm), with the guidance and Razaa of Saiyedna Saaheb (tus), decided the churn out the historical accounts from all the books of Akhbaar which are available in the Library of Da’wat-e-Haadiyah. Since last 9 months, Mazoon Saaheb (dm) and Mukaasir Saaheb (dm) used to discussed about the contents of the books – which things need to be included and excluded. By the passing time, the huge project of compilation of the history of Du’aat saw the light of the day – and with the Du’aa of Saiyedna Saaheb (tus) and Blessings of Allaah Ta’aala Jalla Shaanohu, it coincided with the completion 900 yrs of the succession of Du’aat ul-Akrameen (aq) in Yaman – from 532 to 1432 AH. Several books have been published by Da’wat-e-Hadiyah till now in the khidmat of mumineen. Our community was centred in and around Badri Mohalla 15 yrs back. With the passing time; as the families expanded, businesses prospered, students started opting for higher studies, job opportunities increased, mumineen started shifting from Badri Mohalla to other places and even abroad. Exposure to the modern education, fast communication, internet and other things whose medium is English language, it became mandatory upon us to publish the book in English so that the Alavi students all over the World are able to take its advantage. Present scenario is such that a child of our community settled in Mumbai or USA is only able to speak Gujarati but he is unable to read its written script. Hence to make this marvel of history of Du’aat (aq) of Yaman readable to the all ages, Saiyedi Ra’s ul-Hudood Zulqarnain Hakeemuddin (dz) took the responsibility of translating the whole book in English language. He has been translating the articles of our community website since long. Hence it was not difficult for him to accomplish this work. However, keeping in mind, the variedness of reader’s interest with respect to his age, He has simplified the book-matter as far as possible. We wish that reading the history of Du’aat of Yaman would be enjoyable and interesting to the mumineen. History of Du’aat ul-Akrameen (aq) of Yaman is the first part of the project. Insha-Allaah after publishing this book we will undertake the compilation of the history of Du’aat ul-Akrameen (aq) of India. May Allaah, encourage us to do khidmat of Da’wat and make us the true believer of Hablullaahil Mateen and enlighten our hearts with the Walaayat of Imaam uz-Zamaan (as) and Da’i uz-Zamaan (tus). A comprehensive historic account of each Yamani Da’i is given. Along with the history the books which Du’aat wrote and what is its subject matter is explained. Different ash’aar is given at the end of the description of each Da’i. During the Da’wat of Yaman, the role of different of Maulaayi in India and the important of their time is dealt with. Different places of Yaman are shown in a map. A list of 24 Du'aat-e-Keraam (aq) is given along with their tenure of Da’wat. Colour photos of mazaaraat and maqaamaat of Yaman is specially included. For the first time the entire history in Gujarati has been lucidly translated into English. Note: Mumineen must get their copy of Ashaab ul-Yameen from the Markaz of Da'wat-e-Haadiyah as early as possible.